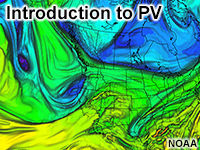 You've been introduced to Potential Vorticity (PV) as a concept or as a useful tool for NWP assessment, but what is PV really? We'll dive into PV in this lesson and attempt to answer some of the more common questions about PV as a product. This is the fourth in a series of video lessons that introduces three different methods for modifying NWP output to add human value to forecasts. Define the different pieces of the PV equation. Identify on a 1.5PVU height field what the likely contributors are to the PV height value. Identify conveyor belts and vorticity centers from a 1.5PVU surface. Identify the processes that are NOT included in the PV equation.